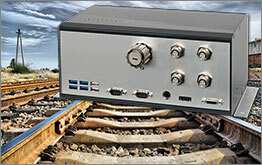 The PIP30 Product Family is a high performance, low power, and highly integrated rugged Embedded Computer, designed for railway operation. 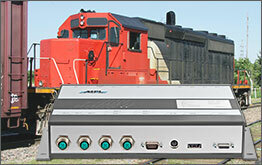 The solution is available in a compact aluminum housing with flange mounting. The unique chassis solutions allows to operate the PIP30 in a moderate as well as in harsh environments without the need of a fan or ventilation holes. The design integrates standard connectors for easy connection or lockable headers, depending on project needs. The cooling plate for the open frame versions is chromated. Depopulated versions or solutions with headers can be offered. EN50155 approved PIP38-1 equivalent, including isolation of board and system ground, galvanic isolation on the input, input range 9-36VDC, 4 x LAN on M12. EN50155 approved PIP37-1 equivalent, including isolation of board and system ground, galvanic isolation on the input, input range 9-36VDC, 4 x LAN on M12. 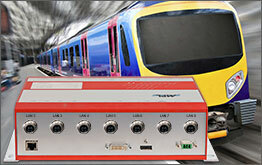 EN50155 approved PIP32-1 equivalent, including isolation of board and system ground, galvanic isolation on the input, input range 9-36VDC, 4 x LAN on M12. EN50155 approved PIP31-1 equivalent, including isolation of board and system ground, galvanic isolation on the input, input range 9-36VDC, 4 x LAN on M12. EN50155 approved PIP31-2 equivalent, including isolation of board and system ground, galvanic isolation on the input, input range 9-36VDC, 2 x LAN on M12. 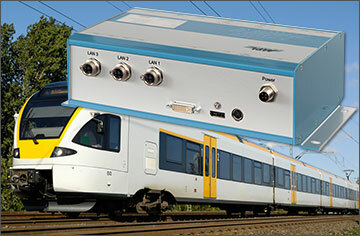 EN50155 approved PIP3x equivalent, including isolation of board and system ground, galvanic isolation on the input, input range 9-36VDC, 4 x LAN on M12.